Bro. Michael Luttrell serves as Secretary for Azusa StreetRiders International. Bro. Michael was introduced to the Azusa StreetRiders and became a member in 2009. He served in various capacities with his local chapter including secretary, president, and vice president prior to being elected to serve as secretary on the international board. Bro Michael is from Eminence, Kentucky. It is the favorite time of year for the ASR membership!!! It is time for the national rally!! Good riding, tasteful eats, great fellowship, and tremendous church is the normal adventures of every ASR national rally. The annual business meeting will be held on Saturday, August 4th and will be including the election for ASR international secretary. I wanted to take this opportunity to say thank you for the opportunity that I have had over the past 2 years to serve each of you and this ministry. It was an honor to have your confidence to vote me into this position and it has been an honor to serve as Secretary. I have decided that, at the current time, it is most profitable for my family, the ASR, and myself to refrain from seeking another term in office due to various responsibilities of “life” and the ministry that I am involved with inside of my home church. I ask that each of you join me in continuing to hold up the current and all future ASR boards in prayer. Now, it’s rally time; let’s get ready for church!! May God bless and keep each one of you. As we all know, we are at that time of year that has been set aside to recognize the ultimate sacrifice of the Lamb and the resurrection of our Savior. There was only one spotless Lamb whose blood was capable of redeeming sinful mankind. It is critical that everything that we do is covered by His blood. We know that Hebrews 9:22 teaches us that “without shedding of blood is no remission”. Isaiah 53:5 tells us that “he was wounded for our transgressions, he was bruised for our iniquities: the chastisement of our peace was upon him; and with his stripes we are healed”. Revelation 12:11 lets us know that “they overcame him by the blood of the Lamb, and by the word of their testimony; and they loved not their lives unto the death.” Verse after verse of the Holy Cannon shines light on the workings and importance of the blood of Jesus Christ. We are blessed to know that God wrapped himself in flesh and became our sin in a humiliating crucifixion and shed His blood to become our redemption and allow us, sinners, to go free. Beyond the death and burial, there was a day of resurrection. We MUST take this news to a world that is hurting, hungry, looking, and needing Jesus. If they could only understand that what they are looking for is Him. We must let them know that regardless of all pasts and current situations, issues, hurts, pains, addictions, problems, and sin, the blood covers and heals!! Nothing is too great for the blood of Jesus Christ!! Our ministry, teaching, preaching, and witnessing is not in vain!! For He has risen!! Because He lives we can………. Tis the season for Thanksgiving. And Christmas. And an abundance of cooking and eating. And Christmas banquets. And Christmas decorating. And Christmas shopping. And wrapping gifts. And exchanging gifts. And traveling in cases. And……. It is a very busy time of year. However, with a few exceptions for those fortunate enough to live in a climate conducive to year round riding, there aren’t many opportunities to enjoy two / three wheel therapy in this season for most of us. With that thought in mind, what do we do as part of the Azuza StreetRiders when we are unable to ride? 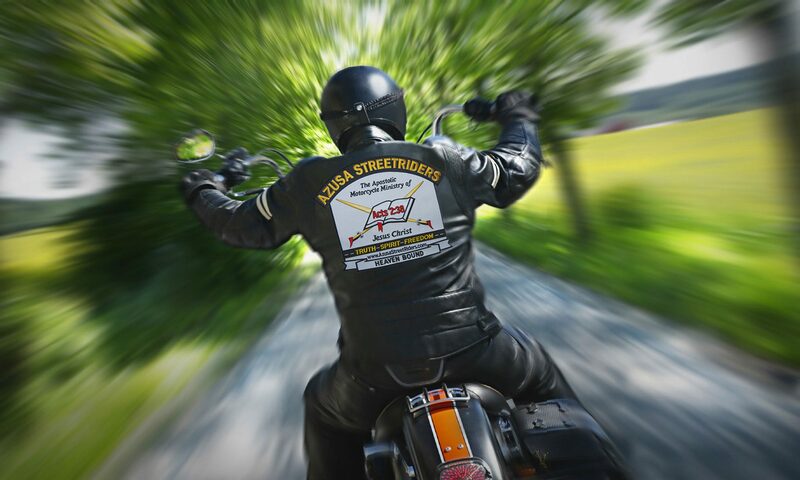 While Azuza StreetRiders is certainly the “Apostolic Motorcycle Ministry of Jesus Christ”, please remember that we are called to be witnesses even beyond the motorcycle community. We must reach EVERYONE within “our world”; even those who don’t have the slightest interest in motorcycles. While we continue to put forth efforts to reach those within the motorcycle community, we must not lose sight of the “big picture”. Luke 14:23 instructs us to “Go out into the highways and hedges, and compel them to come in, that my house may be filled.” This instruction certainly includes but is not limited to motorcyclists. Although our motorcycles may not be our most effective tool during the winter months (for most of us anyway), we can ill afford to take time off from attempting to pull souls out of the grasps of Hell. We must continue to work while it is day. I am confident that we have all heard and are hopefully making a conscious decision to be thankful every day and not just on Thanksgiving. Hopefully, we all recognize that the true meaning of Christmas is to set aside a day in each year to reflect upon the birth of Jesus Christ even though we continue to put Him first in our lives 365 days a year. However, I want to encourage each of us to remember that we are called to be witnesses year around; not just during “riding season”. With this in mind, I have been reminded that even during ’Tis The Season, I must be busy for the Kingdom. From my childhood, I have heard phrases like “the older you get, the faster time passes” or “time flies when you’re having fun”. Unfortunately, it has taken me a few years before I began to realize how fast time does indeed pass; regardless of fun or not. We set alarms to wake up in just enough time to get ready and make it to work on time. We know just how much time is needed to get the kids ready and to school, how much time that we have for breakfast, and how long the drive should take to get to the office. It is not unusual that a calendar dictates our activities for each day. We can block it down to 15 minutes or 30 minutes to increase the efficiency of our time management for the day. We intentionally set aside time for the things that take priority; the things that we feel are valuable and important to us. Upon reviewing our schedules and calendars through those lens, would we be shocked to see the clarity of our priorities? At the end of the day, whatever is left undone on the calendar or not checked off on our “to do” list is penciled in for attention on the next day. Life is busy and full of distractions in addition to our already busy schedule. It is so easy to allow our prayer time to become a stale laundry list, and our Bible study time to become intermittent, and to go through another day without witnessing or inviting someone to church. How many days has our Bible study been pushed back? How many days has it been since we marked prayer off our list? I encourage each one of us to reevaluate the necessity and importance of our devotion and witnessing in our life. I suspect that each of us, if completely honest with ourselves, recognize the importance and can admit there are areas that offer room for improvement. I am convinced these improvements will only come through intentional forethought and planning. With intentional planning, our devotions aren’t limited to “if I have time” but can be intentionally placed into our schedules. Now prayer, Bible study, church attendance, witnessing, etc. has a purposeful place in our lives. Please know that I am not suggesting that we need to turn our devotions into little more than a checklist. On the flipside, I am suggesting that if we want to be consistent and faithful in our devotion to Him, the first step is to make a conscious decision to be intentional. Our devotion(s) deserve to be intentionally placed on our calendars and are important enough to be prioritized at the top of our lists. There needs to be that spot in our day that is marked out for uninterrupted time with Him. My Savior. My Father. My Friend. Just a quick reminder that all absentee ballots must be RECEIVED no later than July 14th. Absentee ballots will not be accepted after July 14th. Feel free to contact me via email, text, phone call, or on FB messenger and I will get the absentee ballots to you. My contact info is listed below. It is the most exciting time of year for the Azusa StreetRiders. Not only is riding weather in full swing, we are also rapidly approaching the 7th Annual National Rally and our annual business meeting. This is always a great time of refreshment and renewing while having tremendous church, riding, and fellowshipping with our ASR family. As we prepare for this event, I want to encourage every one of us to reflect upon our purpose within the ASR along with our mission as a whole. We must continually remind ourselves that our purpose is to take the gospel of Jesus Christ and salvation message of Acts 2:38 to a world that is hungry and seeking fulfillment through various avenues. We fulfill this mission through various methods. It is imperative that we are individual witnesses and incorporate personal evangelism in our life. Our chapters organize and host local events throughout the year. Motorcycles are donated through the Motorcycles For Missionaries program to ministers that provides a new avenue for them to reach even more people efficiently and timely. The common denominator in each of these avenues is us; each individual member of the ASR. Each one of us must be sensitive to the voice of the Holy Ghost for direction in our personal lives, in our chapters, and for the direction of the ASR as a ministry and organization. As we reflect on the purpose of the ASR, I also ask that each of us spend extra time in prayer in regards to our upcoming annual business meeting. I am confident of your knowledge that we will be electing three of the board positions; President, Vice President, and Treasurer. We are blessed with great nominees. Each of these nominees have given of themselves to the ministry of the ASR and have proven through time and efforts that their heart is in the ASR. That being said, every organization is at a critical juncture when faced with a possible change in leadership at three out of four elected offices. However, the ASR isn’t just any organization. The ASR is an Apostolic ministry. We MUST know and follow the direction of the One that this ministry is to represent. For that reason, I cannot adequately stress the importance of seeking His direction and will for the upcoming election. I implore each of you to join me in prayerful consideration that will enable each of us to cast our ballots with certainty that, ultimately, the will of God will be accomplished. I look forward to seeing you in Texas!! Elections will be held for ASR international President, Vice President, and Treasurer at the annual business meeting this year. As always, it is imperative that we include prayer and fasting throughout the election process including nominations and voting. We must focus on Him and His will to allow His direction for this ministry to be fulfilled. All nominations must be submitted no later than June 15. Nominations will not be accepted after June 15. Nomination ballots are available and are posted on the ASR website. You can also request the nomination ballots from me if you have issues accessing them from the website for any reason. My contact info is listed below. Feel free to contact me on FB messenger, email, text, or call and I will get the nomination ballots to you. Absentee voting will be underway shortly after the close of the nominations. Please stay tuned to the website and the Azusa StreetRiders Facebook pages. Also, I am asking everyone to please help me get the word out. Chapter presidents, please be sure to communicate this information with your chapter. The ASR witnessed TREMENDOUS growth in 2016 and we, through faith, expect the growth to continue as we work together to build the Kingdom of God. We desire to experience spiritual growth and numerical growth simultaneously. The board is currently developing a plan to implement a few new key positions to continue to strategically propel this ministry. Now is the time if you are interested in becoming more involved in this ministry. We are asking that everyone please be in prayerful consideration of the following. We want to hear from everyone that is interested in being appointed to a position to help serve this wonderful ministry. There is a work for everyone to do. Please submit the following information to President Anthony Todd Storey or Secretary Michael Luttrell for consideration of the board. Please include all strengths (Administrative, communication (phone and / or email), etc.) with details. Also, please advise if there are any particular interests within the ASR ministry for which you feel a special burden (motorcycles for missionaries, event planning, membership connections, etc.). Please feel free to include any information about yourself, your vision / dreams for the ASR, etc. In addition to the department heads, we will also be looking for people to work within these various departments as well. So as you can see, we will need SEVERAL people to jump on board. There is work available for all that are willing. Excited about the doors that we believe God is opening for this ministry in 2017!! I am extremely thankful for this ministry; and equally thankful to be a part of it. There is no doubt that we are taking the one and only true message of salvation to a culture and world that seems to have possibly been avoided throughout history. We carry the true Apostolic message. However, I have a question that I hope will drive each of us to intentional and genuine soul searching. Is it possible that we can be a member of an Apostolic ministry without being a genuine Apostolic Christian? Is it possible that we can be a member of Apostolic churches without actually living an Apostolic lifestyle? The early Apostolic church was driven with a passion to win the lost. Is it possible that we can become personally content residing under an Apostolic label only to slip away from our desperation to fulfill the great commission? Is our personal greatest endeavor still to find another hungry soul that we can point to Calvary? Are we content with a personal Apostolic experience that included an initial repentance, being “buried with Him by baptism”, and experiencing our personal Pentecost only to slip into complacency? Or on the contrary, are we still driven by the heartbeat of God? Souls. We must work while it is day. I desire to move beyond the contentment of simply residing under the umbrella of an Apostolic church, Apostolic ministry, and Apostolic label. Please don’t misunderstand me; I need each of these in my life. However, my desire is to be an Apostolic Christian. To have an Apostolic heartbeat. I pray that our vision and our focus is to passionately fulfill The Apostolic Motorcycle Ministry of Jesus Christ; leading souls to Him. Who is that? What is their name? These are common questions that we ask when we see an individual that we don’t know. As of recent, I have been reminded of how much people are looking to specific individuals for hope and direction. In the very recent political event, it was extremely clear that each side of the stage was pronouncing the name and power of their candidate as a large portion of their political platform. Now I am watching as sports becomes the main topic around the “watercooler” with the approaching Super Bowl and March madness right around the corner. I am hearing how that “this” team will win because this particular individual(s) is on that team or that team will win because they have that particular player. I am recognizing that people’s attention is captivated by distinct persons regardless if the topic is politics, sports teams, employers, singers / music, or even Hollywood. With that in mind, I am reminded of the focal point of the ministry of the Azusa StreetRiders. As the only internationally recognized Oneness motorcycle ministry, it is imperative that our focus remains on Jesus Christ. We have the “One” to offer that holds all power within His hands. We have the ability and responsibility to introduce this world to Him. Regardless of who people are looking to for their help, we know the One that goes far beyond the doctors, counselors, and advisors of this world. Not to mention, that He is the ONLY savior!! He still forgives sin, delivers from addictions, heals the sick, mends broken hearts, and gives hope to the hopeless in 2017!! And that doesn’t even scratch the surface of what our God can do. So as plans are underway for rides, events, and outreach for this year, please remember to make God the CENTER of everything that we do. The ASR is really all about Him. It is His ministry. Any and all “success” is attributed to Him. Let’s work together and each one do our part to make 2017 a great year by “building up yourselves on your most holy faith, praying in the Holy Ghost”, “consider one another to provoke unto love and to good works”, and, ultimately, talking about and showing this world Jesus. “Neither is there salvation in any other: for there is none other name under heaven given among men, whereby we must be saved.” We must remind this world (and sometimes ourselves) that everything we are needing and looking for is found in Him!! It’s all about him! !